Krista: I understand you don't want to blog on Killer Characters, Mr DuBois. Mr. DuBois: Let us be clear. It is not as though I am computer illiterate. It is simply inappropriate for me to engage in gossip about the Maxwells. Krista: That's fine. I'm more interested in you. Mr. DuBois: I can't imagine why. I am the butler of John Maxwell. He is the adventurer. The one who travels to places no sane person would ever wish to go. Krista: You don't approve of his travels? Mr. DuBois: Of course not. Pythons, scorpions, and unsavory characters? Please. Krista: How long have you been with him? Mr. DuBois: I came to the Maxwell family as a young man. Of course, John's parents are both gone now. It's just Maxwell and his sister Liddy. Krista: Does Liddy live in the family mansion with John? Krista: You're not fond of Liddy? Mr. DuBois: Miss Liddy is a taxing person. I get quite enough of her when she visits. Krista: I've been told that you refuse to prepare dinner for Liddy when she comes to the mansion. Mr. DuBois: There are plenty of restaurants in Georgetown. Maxwell can entertain her elsewhere. Krista: You seem uncomfortable. Is everything all right? Mr. DuBois: Miss Liddy has a grown son. A most undesirable fellow. Apparently his roommates have kicked him out, and now he and his mother have set their sights on the carriage house at the mansion. Krista: Has Maxwell agreed to that? Mr. DuBois: No! He has proposed that a young woman move into the carriage house instead. It's a nightmare, I tell you. Krista: That would be Florrie Fox. What's wrong with her? Mr. DuBois: It's simply a nuisance to have anyone else residing on the property. She will come home late at night with noisy friends. They will undoubtedly wish to lounge around the pool, and I shall have to clean up after them. And she has a cat. Krista: So maybe Maxwell's nephew isn't so bad after all? Mr. DuBois: We have no choice. If the nephew moves in, he will surely slit our throats as we sleep. Even the presence of a cat on the property is preferable to that. 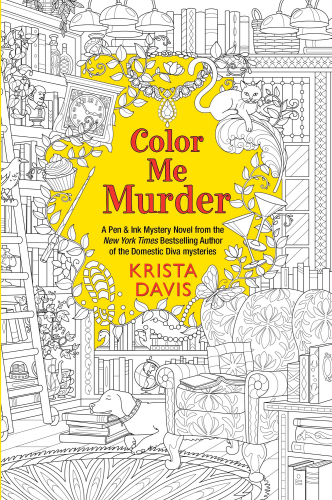 The covers of COLOR ME MURDER can be colored! It's now available for pre-order. I have one final advance review copy (it does not have a colorable cover) to give away. Leave a comment with your email address to enter to win it. Good Luck! Mr. DuBois sounds like quite a challenge himself. He apparently is impressed with his own importance. He does seem to have a strong personality, or is that putting it mildly? Looking forward to reading this book and getting to know Mr. DuBois. Thank for the giveaway! Lldawnjm (at) gmail (dot) com. Ever since I first read about COLOR ME MURDER, I've been dying to read it. Can't wait to learn more about the Maxwell family and Mr DuBois. Thank you for the chance to win a final advance review copy! Excited for both of these!! Thank you for the chance to win a copy. I'm excited to read it. I don’t color. I just like to read your books. suefoster109 at gmail dot com. This sounds awesome! Would love to wins this! brichardson0056(at)yahoo(dot)com. I would love to be an advanced reader for Color Me Murder. I enjoy being among the first to read. Mr. Dubois appears to be an interesting character. I love blogs like this where the characters get a voice! Can't wait for the release. Thanks. SueP. This looks so fun! Would love to win. Love your books! Thanks for the giveaway! My email isbeturner0418@icloud.com. Would love to read and color! Thanks for the drawing. pjreiser@aol.com. I would love a chance to read a new book by you!! Thank You for the chance!! EEK! This is awesome, I love it! Thank you for the chance. I'd love a copy of the book. I don't care if it can't be colored. I just want to read it. So excited about these two new books. Love you Krista Davis! Hi, Marlene Ezell here. Thanks so much for the giveaway. I am looking forward to this book. Loved the description of the book. Sounds like a great start to a new series. Can't wait to read. Aside from the awesomeness of another installment in this series; I'm in love with the idea for the cover! It's so original and wonderful! Thanks for the post and the chance to win! Sounds like another great mystery...thank you. I'm looking forward to reading this. I wouldn't mind winning a non-colorable copy, as I probably won't color it anyway (I just wouldn't, no particular reason why). Thanks for the opportunity to enter to win. hanson(dot)don(at)yahoo(dot)com. Looking forward to reading Color Me Murder -thanks for the chance to win an ARC! A great post thank you & I am LOVING the cover idea. Clever concept about coloring books. Thanks for the opportunity. I love coloring books. Sounds like a great new series.. Thanks for the chance to win! Congratulations, Alisha Collins! You are our winner!